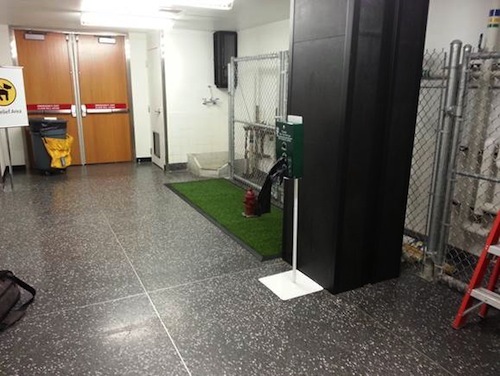 Seattle’s airport is one of a handful of U.S. airports that offers travelers with dogs a pet relief area on the air side of security, meaning that you don’t have to exit the airport and return through security to give your dog a bathroom break. It has changed appearance over the past couple of years, and for a few months shifted locations, and my post about it became increasingly baroque with cross-outs and amendments. Now it’s back in its original location, and it’s time for a new post, with new photos. 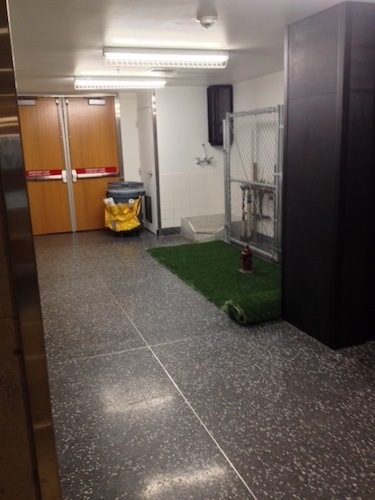 The sign for the pet relief area — just beyond it, you see the hallway you’d use to exit the secured area. Don’t do that! Instead, walk down the short hallway I’m standing next to. As you can see, it’s minimal. That roll of Astroturf has seen a lot of use over the years, and is now an unpleasant object. Chloe will pee on it, but only reluctantly. There is a trash can, and there are some paper towels — often your best option for picking up poop, since poop bags aren’t always provided. 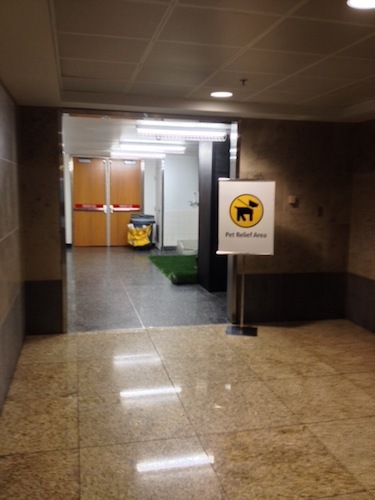 It’s perhaps no worse than most other indoor airport pet relief areas — the San Diego, Minneapolis, Dallas, and Pittsburgh airports have equally minimal indoor pet relief areas, and Salt Lake City has a very basic outdoor air-side pet relief area — but it falls sadly short of the standard set by the indoor pet relief areas at Washington’s Dulles airport. 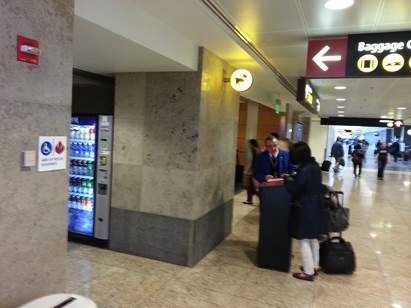 Please note that Seatac also has two outdoor pet relief areas, one to the far left as you exit the baggage claim area, and the other a stiff hike to the far right, but visiting either spot will require you to return through security. Thanks so much to reader Gery for the photos and for the kick in the pants — it would have taken me even longer, without you, to post this update. 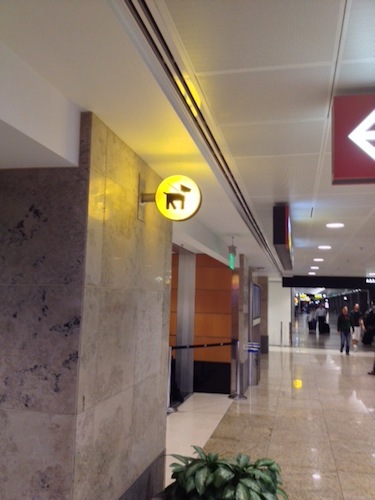 I am adding this post to Dog Jaunt’s ongoing series of reviews of airport pet relief areas. 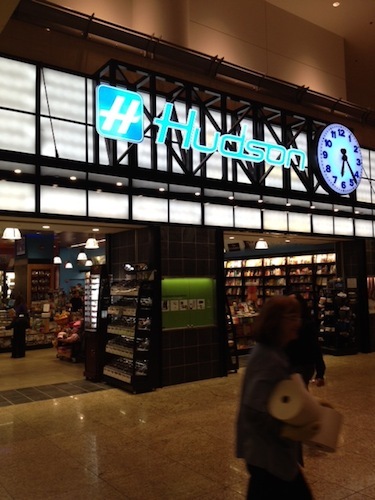 To see others, visit Dog Jaunt’s handy guide to airport pet relief areas. 9 June 2016, SEA TAC. The doggie loo is between gates a and b, near kiddie playground. That dog area is disgusting and needs a serious update. It smelled so bad we could do stand there long enough to let our dog even attempt to use it. I would consider this dog area false advertising.